Brockley's got another free cash machine, outside the new Sainsbury's Local, which opens later this month. This brings the total near the station to five, plus one in Crofton Park, one in Ladywell and another on Lewisham Way. That's nearly one for every actual shop in the area and compares with none near the station and one in the whole of greater Brockley only six years ago, a situation BC used to grumble about to the cash machine gods. 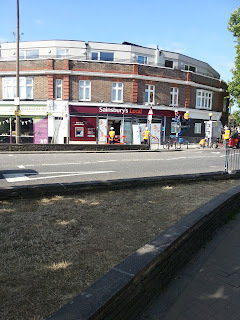 Still relatively few places to buy good fresh produce, but hopefully the new Sainsbury's will help on that score too. With thanks to Scott for the heads-up. Usual full disclosure: Sainsbury's is a client of my employer, Edelman. I feel really terrible for the corner shop just up the road. I am pretty sure that when Sainsburys open that will be the end of him. Such a shame he has been there for as long as I can remember over 20 years. Things always change ... I'd love it if it turned into a cafe (or another building nearby), would be great to have some permanent social space on this side of the station. It's too far away from the Station. There was a café under the grey block of flats but it just wasn't getting the trade so closed. Please can we not speculate about the demise of local businesses, even if only in sympathy. Definitely. It will be good to stay in the local area to do my shopping. A much needed addition to the area. When they put those in it was that really dry Spring, I kept telling the Broca to water them as they were going to die, but they didn't. For a shop that prides itself on environmentally sound produce, pretty ridiculous not to try and keep the trees directly outside alive whilst they grew proper roots. "Edelman is one of the UK's leading public affairs consultancies working for a wide range of clients including Starbucks, Sainsbury's"
You work for them so it's a vested interest mate. Does a local sainsburys need "bigging up" on a site that has an open comment policy for people to accuse it of being a corporate monster destroying the high street? im sure it could do without. Thanks for the research about EDLEMAN, the disclosure is in the actual article so your not really adding anything. Nelson N, stop and think a minute. How do you know that Nick works for Edelman's? Yes, that's right. Because he has told us. If he wanted to big up Sainsbury's on the quiet he could run this blog under a pseudonym. Instead of which, he has taken the time and the trouble to tell us who he works for and who their clients are every single time there could be a conflict of interest (including in the article above) so we can take that into account when deciding whether we accept what he says. He couldn't have been more transparent. So what is your point? You don't have to explain the connection it's explained many times on this site. You said it was my job. It isn't. I don't work for them (you can see a full list of my clients on my Pinterest board "Full Disclosure"). The article was about the cash machine. The only reason I know about it is because BCers told me about it. The treatment I've given this story is virtually identical to the coverage I gave arch rivals Tesco when they bestowed a cash machine on us a few years back. The fact you work for Edelman's shows your pro-supermarket when these shops should be met with opposition. You paint a picture of them helping the local area instead they drain money away from it as profits go to shareholders not the local area. Just because he told us he works there is no defence. Sainsbury's & Tesco are both bad news. We need to support the local economy not the City. Who's "we"? Anyway you are able to make a case against, which you have. Seems opinion is fairly split on this site so not sure what you're carping about. I wonder how many people's pensions are invested in supermarkets? I wonder how they pay compared to little corner shops? I'm suspicious of off the shelf, simplistic arguments. I guess "we" can all decide where to shop. Great news although this new store will make Broca look even more tired. If the vegetables are fresher then it will also mop up all the business. We have the luxury of two free cash machines on Lewisham Way. We're booming at this end of town! Actually Crofton Park has 2 cash machines: Barclays and Post Office. Nick's blog does a great job of promoting local businesses. As do the the facebook, pinterest and twitter bits and pieces he has set up. Any conflict of interest is a little tenuous seeing as Nick doesn't work for Sainsburys himself - At worst Nick might not bad mouth a corporate client but he doesn't prevent negative views of Sainsburys being posted. Conflicts occur in life the question is are they serious and how are they managed. In this case its not serious, its been declared, no local voices have been sensored or vested interests secretly promoted. Has anyone thought how this might affect Jay from Budgens? Fine he promotes the area but wouldn't it be better if when a story about supermarkets was needed someone neutral could write it? You wouldn't get the CEO of BP writing news stories for the Indy would you? what Jays in crofton park? not at all as it's in Crofton Park. You could well ask how Jays takes trade from the smaller convenience stores that dont have the advantage of being franchised but that doesn't fit in one of the "supermarket = Evil" "small store = honest little guy" generalisations. I think a high street in an area of mixed income needs alternatives. Nelson - Its Nick's blog. Its written by Nick. If you want it to be written by someone else, read somebody else's blog. There are numerous articles by interested parties in newspapers every single day! Just check the guest writer or letters to the editor section. You certainly could have the BP CEO writing in the Indy - it could even be in circumstances where there is a conflict e.g. oil vs solar. As long as it is declared who he/she is then the reader can make an informed view on the merit of the article. Who cares, the weak make way for the strong as Johnson from Peep Show would say. This is a ridiculous argument for many reasons, but mostly because this article is not about supermarkets, it's about the fact we have a new cash machine in the area. Someone else "wrote" it, to the extent they sent me the news that it had appeared, I just turned the tweet into an article and remarked about the rapid spread of cash machines. Or you could have done it yourself. This is very good because we'll need more cash to shop at a Sainsbury's Local than at a regular Sainsbury's! I've found that the Sainsbury's Local in Bethnal Green can be about 10% more expensive than the larger Sainsbury's in Whitechapel on various goods. And interesting to see that Brockley Central is carrying a Wonga advert today too! I think BC just supplies the banner space and then google decides what ad to insert for each user based on their browsing habits - you get wonga, I get B&Q - you may have been googling loans or mortgages and I may have been googling skirting boards... Big Bother is advertising. That is my definition of luxury too! Oops I think I got caught out like that MP on twitter, the advertising's all based on sites I frequent. I got Thai brides, not sure what I've been up to. Well I will be shopping at my local Sainsburys. Exciting! A new Jerusalem is being built on the westside. Choice and value over shallowness and expensiveness. im not anti supermarkets, that would be silly, but i wouldnt class the experience as "exciting"
I live three streets away and was on crutches at the time. As lovely as the Broca Food Market is, we are glad this place is opening. The prices of the Food Market are rather high for some of the products we need. We will still be going there for the odd bits, but over all the new Sainburys is a very welcomed addition. All we need now is a new bar in Brockley to save us going all the way to Forest Hill... The Brockley Barge simply isn't our scene, and all the other places are too tiny. Have u tried The Wickham Arms and The Talbot both in Brockley. we probably wouldnt have organic veg and decent olive oil without the supermarkets, we would get what were bloody well given. When a man is tired of the Barge he is tired if life; for there is in the Barge all that life can afford. Welcome to Loserville. Population: you. Great. Looks like i will have the shop to myself. Can't wait! Soberness is a very pleasant complaint for a man in the Barge if he has a comfortable income.